310 pages | 329 Color Illus. 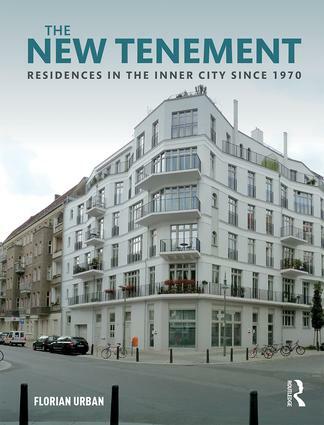 This book examines "new tenements"—dense, medium-rise, multi-storey residences that have been the backbone of European inner-city regeneration since the 1970s and came with a new positive view on urban living. Focusing principally on Berlin, Copenhagen, Glasgow, Rotterdam, and Vienna, it relates architectural design to an evolving intellectual framework that mixed anti-modernist criticism with nostalgic images and strategic goals, and absorbed ideas about the city as a generator of creativity, locale of democratic debate, and object of personal identification.This book analyses new tenements in the context of the post-functionalist city and its mixed-use neighbourhoods, redeveloped industrial sites and regenerated waterfronts. It demonstrates that these buildings are both generators and outcome of an urban environment characterised by information exchange rather than industrial production, individual expression rather than mass culture, visible history rather than comprehensive renewal, and conspicuous difference rather than egalitarianism. It also shows that new tenements evolved under a welfare state that all over Europe has come under pressure, but still to a certain degree balances and controls heterogeneity and economic disparities. Preface . Acknowledgments. I. Architecture and the Return to the Inner City. 1. The New Tenement. 2. New Tenement Style. 3. The IBA Berlin and the Genesis of the New Tenement City. II. Local Conditions, Local Policies, and Symbolic Projects. 4. Berlin—Political Upheavals and "Critical Reconstruction". 5. Copenhagen—Waterfront Metropolis and Welfare State Capital. 6. Glasgow—The Reinvented Industrial City. 7. Rotterdam—Port Town, Reconstruction Showcase, Immigrant Hub. 8. Vienna—The City that Never Changes? III. Urban Housing Themes. 9. Post-Industrial Housing. 10. Urbanizing the Suburbs. 11. Conclusion. Timeline. Bibliography. Index. Florian Urban is Professor and Head of Architectural History and Urban Studies at the Mackintosh School of Architecture, Glasgow School of Art. He holds an MA in Urban Planning from UCLA (2001) and a Ph.D. in History and Theory of Architecture from MIT (2006). He is the author of Neo-historical East Berlin: Architecture and Urban Design in the German Democratic Republic 1970–1990 (Ashgate 2009) and Tower and Slab: Global Histories of Mass Housing (Routledge 2012).